The Trauma Department at The Montreal Children’s Hospital reminds parents that in addition to resetting those clocks ahead one hour when switching to daylight savings time to also check the batteries in smoke alarms. According to Fire Prevention Canada a fire kills an average eight Canadians every week. Residential property fires account for 40% of all fires and a staggering 73% of all fire deaths. Most of these deaths are caused by human carelessness and are completely avoidable. Make sure your smoke detector has the Underwriters' Laboratories of Canada (ULC) stamp of approval. Follow manufacturer’s instructions for proper installation and cleaning. Install at least one smoke detector on each floor of your house, including the basement. 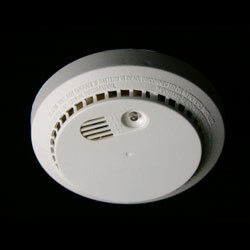 For added protection, you should also install a smoke detector outside each bedroom. Replace all smoke detectors after 10 years. Consider buying a combination smoke/carbon monoxide detector, which costs more money but is well worth it. Ideally, you should test each smoke detector in your house once a month. This makes sure the battery is properly connected and working, and that the alarm rings. Each smoke detector has a test button for this purpose. Buy a few extra batteries when you buy your detector so that you always have some on hand. It's easy to put this important, life-saving task on hold, but DON’T! Keep your family safe, check your smoke alarm battery regularly. For more fire prevention tips, please click here.